learn why birds and other wildlife range or live where they do. Students do research, role-playing, and interviewing to learn why birds live or range where they do. All birds have a range. This is the geographical area where the species can be seen at different times of the year. Range can be divided into breeding range and wintering range. Because some species are very flexible in their survival needs, their ranges can be huge. The European starling for instance, flourishes in practically every corner of Canada, and its range is still expanding! It can live in the country, the suburbs, or a city with no problem. Other species have tiny ranges. The Acadian flycatcher is found only in what’s left of the Carolinian forests of southern Ontario. Because its habitat needs are so specific and that habitat is disappearing, the species is listed as endangered on the COSEWIC list. (Endangered means it is in imminent danger of vanishing altogether.) Territory, however, is the area that one specific bird stakes out to use for breeding, feeding, or both, and that it defends against other birds of the same species. The ranges of many species have changed dramatically in past decades. Some are expanding—perhaps because the species is protected or it has adaptable habitat needs. Other ranges are shrinking alarmingly, and the species has disappeared from parts of it because of environmental or other changes. An increased interest in feeding winter birds has influenced the expanding ranges of some species, such as the cardinal, evening grosbeak, and mourning dove. When you see a robin in your schoolyard, that means your schoolyard is part of its range. On the other hand, if you don’t see a robin in your schoolyard, it could mean one of two things: 1) your schoolyard does not fall into its range; or 2) robins actually do range in your area, but there is nothing in your schoolyard to attract them: no water, no worms or insects, and no trees to perch, nest, or shelter in. The activities in this kit will help you to assess why you see certain birds in your neighbourhood and perhaps find out why you don’t see them. Discuss with students the meaning of range, the difference between range and territory, and the fact that the range for some birds is huge while for other birds it is small. Discuss reasons why ranges can differ in size. Show students examples of the range maps of various species (from a field guide or a book). Maps are easier to understand than a written description of range. 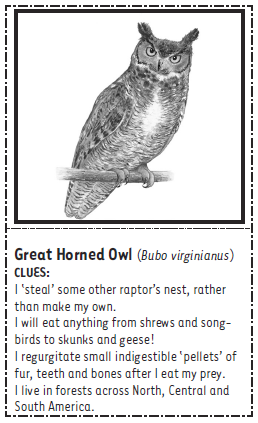 Pick five species of birds that are commonly seen in your schoolyard. Explain that their regular presence means your schoolyard is part of that species’ range. Discuss with students if the ranges are large, small, or medium in size. Is your range large or small? How many provinces or territories does your range touch on? Has your range grown or shrunk in the past 50 years? Tell me more about forces that are damaging to your range, such as toxic chemicals, damming, and new roads. Is your winter range in healthy condition? Have students take turns being "birds" and interviewers.